GPU Technology Conference 2016 is just around the corner. Jen-Hsun keynotes are without a doubt the most exciting time for NVIDIA fans. Those keynotes always bring something new, let it be autonomous driving, new Tegra chip or a highly anticipated GPU. 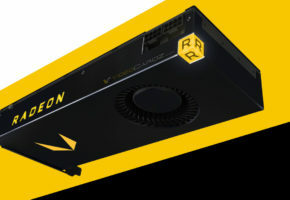 Of course here at VideoCardz we only care about graphics cards, so we are always eagerly waiting to hear more about architectural improvements and new product launches. The next keynote will take place on April 5th in Silicon Valley. I think this is a good opportunity to talk about Pascal. How big are Pascal GPUs? Have you ever tried to measure GPU by comparing it to existing objects? We actually tried that with Fiji, where we only had few chunks of renders, often taken at different angles. It’s really amazing what you can do with new raster graphics software. Our predictions were spot on, the GPU looks exactly how we thought it would and real die size was in our margin of error. Today however we have a bigger task. We want to measure something that is not even being shown in teasers. However we do have some pictures that could help us achieve what we are after. NVIDIA has released two pictures of Pascal GPUs. First it was at GTC2014, where Jen-Hsun showcased first mockup in new form factor. 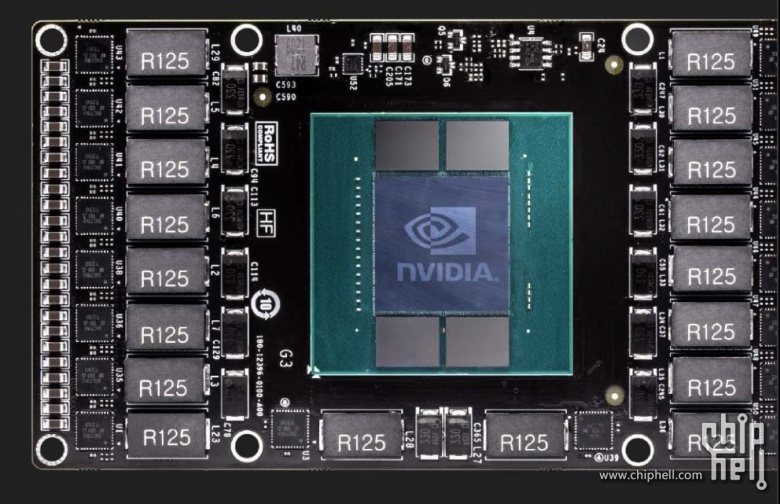 Next year at GTC 2015 in Asia, were were shown a new picture of Pascal GPU. The board has been highly modified, everything from GPU to position of the screw holes was affected. So we didn’t really have any point of reference to compare both mockups. Except the 3D memory stacks. High-Bandwidth-Memory is not the only standard of high-speed memory currently in production. 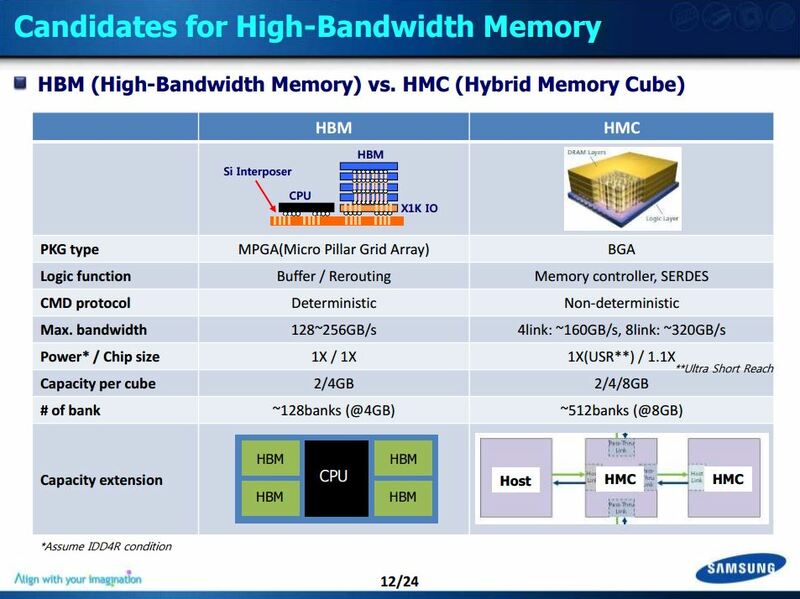 Micron developed HMC (Hybrid Memory Cube), which is often described as a counterpart to HBM. However, the idea behind HMC is different. While HBM chips have to be installed on interposer, HMC cubes are sold and installed separately. 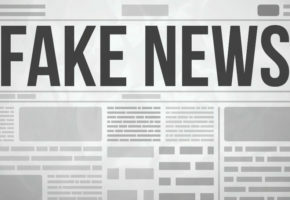 From business perspective HMC is better, because manufacturers are not forced to reveal its secrets to companies responsible for interposer production and further packaging into one device. 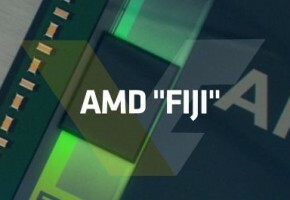 In order to make Fiji, AMD had to partner up with UMC and Amkor, and reveal some secrets in a process. HBM-based devices are simpler to design, and memory latency is lower, since everything resides inside one package. There is no ultimate answer to which technology is better, because we have no HCM-equipped GPUs to compare. The popularity of HBM lies probably in latency, because the reduction of micro-lag can make a dramatic change for VR technologies. So is Pascal using HBM or HMC? Pascal is using HBM, since everything is installed on interposer. However the more important question is: are Pascal GPUs using HBM1 or HBM2? It took me a while to answer this question, because I had to find the exact dimensions of HBM modules and compare them against Pascal mockups. Now, because JEDEC JESD235A standard does not state any dimensions for HBM module, we had to look for details from HBM makers. According to the same document, there only three companies currently planning such chips: SK Hynix, Samsung and Micron. Only the first two are officially producing those chips right now, but only the first one shares details about them. Why is it important anyway? 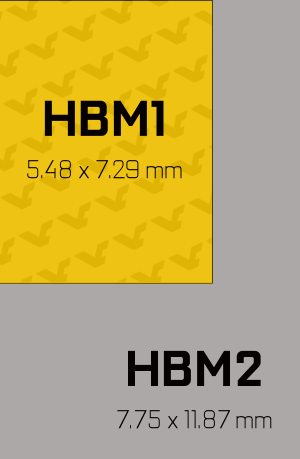 Well if we have a mockup, we can compare HBM size against the whole GPU die and get a rough estimate of its size. Like I said before, there were two prototypes demonstrated by NVIDIA. 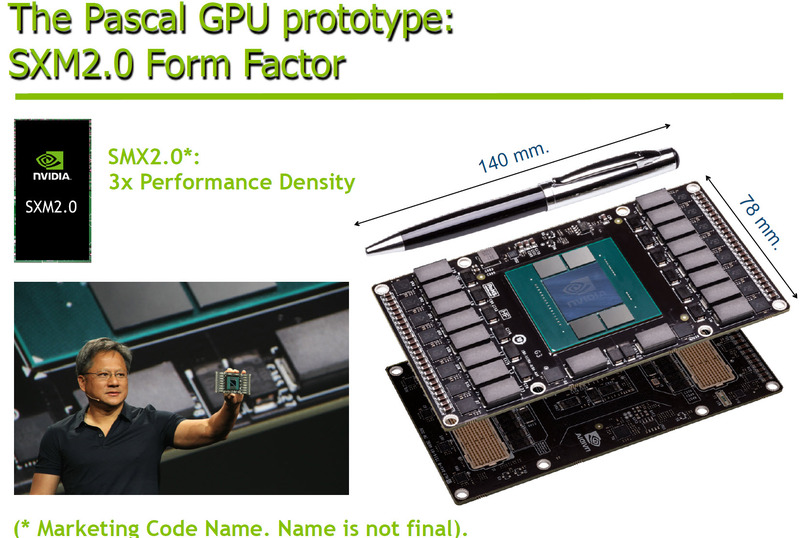 The problem with the first mockup (PASCAL GTC2014) is that we don’t know what kind of high-speed memory it uses. It’s on the same package, so we can assume it’s HBM, however the size of those modules are far from HBM1 chips. In fact, they are even bigger than HBM2 (and that was in 2014). Either this was a super-early sample of HBM, or something we absolutely can’t describe. One of our editors has a theory that these could actually be double-HBM stacks (so total of 8), however I don’t think that’s the case here. Luckily for us, NVIDIA has released some information about the size of this new small form factor. 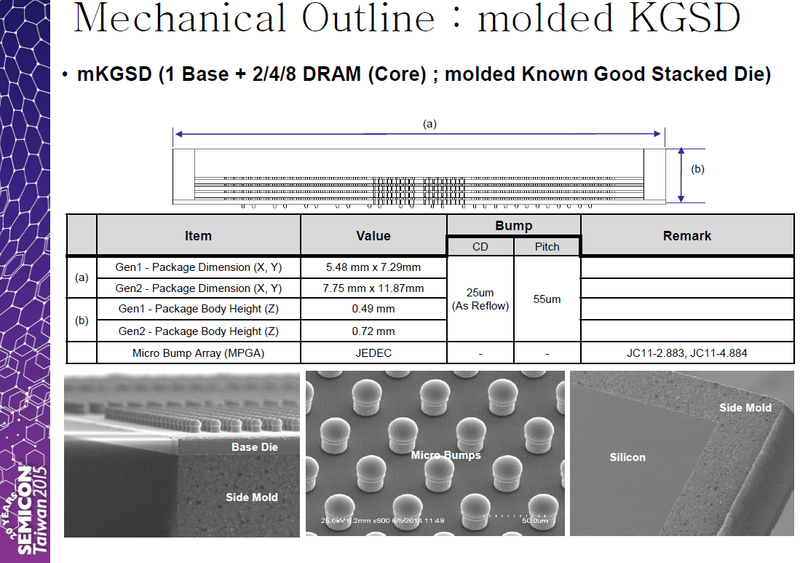 According to this slide, the PCB is 140mm x 78 mm. So what we have to do is it compare HBM1 module size to whole board to adjust the scale for mockup comparison. 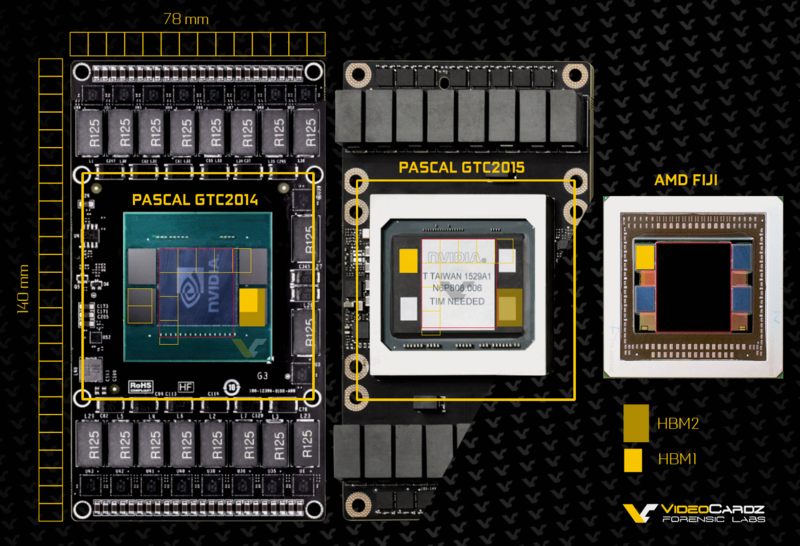 The pictures of Pascal GTC2014 prototype were not very high quality. We either had a choice to use higher-resolution picture showing the mockup at angle, or showing the front, but at lower resolution. We decided to use frontal picture, because we are eliminating distortions. Unfortunately the second mockup (GTC2015) has no frontal pic available, so you have to trust my photoshop skills here. We also have no dimensions for the new form factor (although it is very likely it’s the same as GTC2014). However just be sure, we are also comparing HBM1 stack mounted on the GPU, just so we have two points of reference. Now, let’s stop here for a moment. We are almost sure these are HBM1 stacks (the height/width ratio is correct), but there is enough room for HBM2 (I tried to squeeze one HBM2 stack in lower right corner of the GPU), so my theory is that NVIDIA engineers were forward thinking about installing HBM2 stacks here. 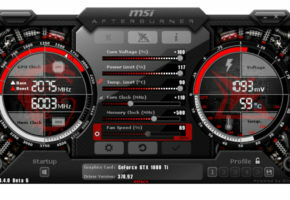 It also proves that this is not the latest GPU, especially considering production date. We are probably looking at very early sample of Big Pascal/GP100 with HBM1. Of course we will also be comparing Fiji GPU, because it’s the only HBM-equipped graphics processor available. Now here’s what you were all waiting for. Now, before you look at the chart below, be advised this is a very rough estimation. The margin of error is probably around ~40mm2. Scale adjustment of just few pixels could mean significant change of the results. The GTC2015 prototype is comparable in size to Fiji. I’m not sure if real size is above 600 mm2 (which would be crazy), but any change to the scale would mean that HBM1 stack is much smaller than specifications would suggest. Meanwhile, the GTC2014 prototype is roughly estimated at 550 mm2. What you should know is that we can’t be sure if both of these are 16nm silicons. 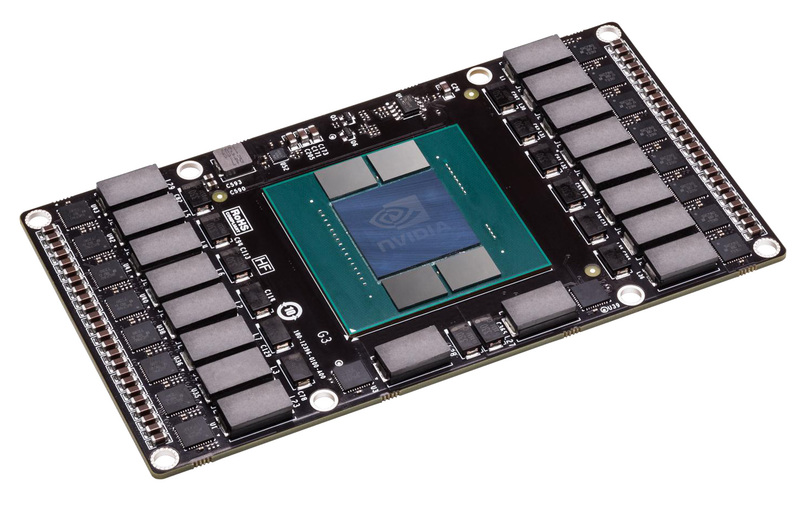 NVIDIA could’ve made 28nm prototypes just to evaluate the benefit of high-speed memory. That said, just because the prototype is 600 mm2 @ 28nm, the 16nm version could be much smaller. Actually I think this is the best explanation to why are those prototypes so big. I doubt NVIDIA is planning such a big GPU in such an early state of FinFET production. Going beyond 600 mm2 could be devastating scenario for manufacturing, resulting in low yields. Judging from the last two GPU Technology Conferences, we have a very good reason to expect more information about Pascal next week. I would be very surprised if we were not shown new Pascal device, updated roadmap or new leather jacket.